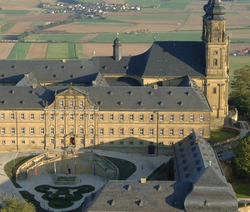 The 28th Solar Thermal Energy Symposium takes place from 13 to 15 June 2018 at the former German monastery Banz, Bad Staffelstein. Particular focus of this year’s event, tailored specifically to German-speaking experts, will be on business models, digitalisation and cost reduction. “Cost development and heating prices in the solar thermal sector” will be the topic of the session lead by Bärbel Epp. Since September 2016 physicist Bärbel Epp, founder of the solrico agency is a member of the Symposium’s advisory board. The advisory board gives support to the organisers in the matter of programme planning, is concerned with the search for speakers, chooses and evaluates the abstracts. In 2018 the “Symposium Solarthermie – Technik für die Wärmewende” is for the first time organised by Conexio GmbH, founded in July 2017 as a 100 % subsidiary of Solar Promotion. On behalf of Solar Promotion Conexio plans and organises events as for example the Intersolar and EES Conferences taking place in parallel to Intersolar fair, which will this year be combined under a new umbrella called The smarter E. The Solar Thermal Energy Symposium as well as the PV Symposium in April 2018 are part of the events that Conexio holds on its own behalf. The selection procedure for the abstracts is concluded by now and the conference flyer gives a detailed overview of the comprehensive programme.